Soybean farmers need to be able to verify products and management practices that increase their on-farm returns. Data from large-scale field trials conducted on commercial soybean farms in an excellent way to generate this information. The Multi-State On-Farm Partnership began in 2015, with checkoff funding provided by the United Soybean Board. Eighteen on-farm trials were conducted in 11 states that year. The interest was so high after that season, that the project was expanded to 30 trials in 2016 with several states, including Michigan, Iowa and Wisconsin, supporting additional project fields through their local on-farm research programs. The 2017 Multi-State On-Farm Partnership program was highly successful with over 95% of trials being successfully executed. 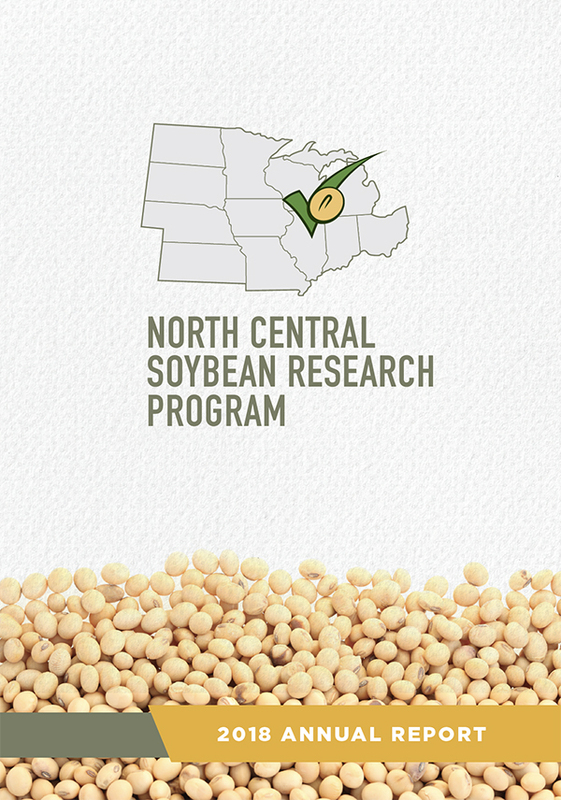 With checkoff funding provided by the North Central Soybean Research Program and the Iowa Soybean Board, 29 soybean research trials were established across nine participating states: South Dakota, Minnesota, Iowa, Nebraska, Ohio, Michigan, Illinois, Kansas and Indiana. Using replicated strip trials across approximately 20 acres per trial, the following soybean production topics were included in the 2017 on-farm trials: soybean population, row spacing, starter fertilizer, foliar plant growth regulator, and in-furrow boron compared to foliar-applied boron. Soybean population. The most popular research topic in 2017 (and 2016) was soybean population trials. Sixteen soybean population trials were conducted in eight states with populations pushing the extremes on both ends. Four trial locations featured 80,000 as the low soybean population and 190,000 to 200,000 as the high population. Results from the population trials varied greatly. In two research locations in Ohio, the 80,000 soybean population out yielded the highest populations (190,000 and 200,000) with one location showing 80,000 seeding rating with a 10.1 bu/ac advantage over the 190,000 rate. Averaged across all locations, the optimal seeding rate was between 120,000 and 160,000 seed per acre. Yield results need to be compared with rainfall amounts and timing for a more thorough analysis as to which conditions best favored which soybean population. 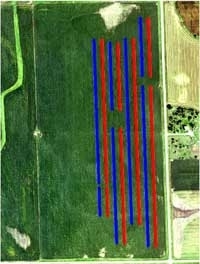 Soybean row spacing. Researchers conducted four soybean row spacing trials across three states in 2017. Comparisons typically consisted of 15 inch row spacing versus 30 inch row spacing. A single location also included 7.5 inch drilled row spacing. Results from the majority of these trials were consistent with previous years research showing a positive yield response for 15 inch soybean spacing versus 30 in soybean spacing. Across the three 15 vs. 30 inch row spacing soybean trials, the 15 inch soybeans maintained a 3.4 bu/ac advantage. In the Nebraska location, which also studied the 7.5 inch drilled row width, results favored the 7.5 in row spacing on irrigated ground. Drilled soybeans saw a 3.5 bu/acre advantage over 30 inch row spacing and a 4.2 bu/acre advantage over 15 inch row spacing. Results from this location are reflective of the early season stand counts collected. Starter fertilizer. Starter versus no starter trials were conducted across five locations in four different states. Indiana, Minnesota, Nebraska and South Dakota all did research comparisons using slightly different starter fertilizers. The most common starter was a 10-34-0 applied in-furrow at planting. Harvest populations favored starter trials, but across all locations, no measurable yield response was found between the treatments. These results are consistent with the 2016 starter versus no-starter trials as well. Foliar plant growth regulator and fungicide. Several of these research topics had more than one location, while others were limited to a single location. Foliar plant growth regulator was compared with a fungicide application in a single trial conducted in South Dakota. It showed very little difference in response with the fungicide not providing enough return to justify the cost this year. The effects of a plant growth regulator, applied at R1-R2 growth stage, was studied at 3 locations. Two different, but similar industry products called Ascend and Vigeo, were applied. Both products promote flowering, pod development, and seed filling. The products had no effect on yield this year. Boron. The application of in-furrow boron had a greater yield response compared to a foliar application of boron. While limited to a single trial in Indiana, the in-furrow application resulted in a 5.39 bu/acre yield response. This type of response, though only in a single location, warrants additional research in the 2018 multi-state on-farm partnership. 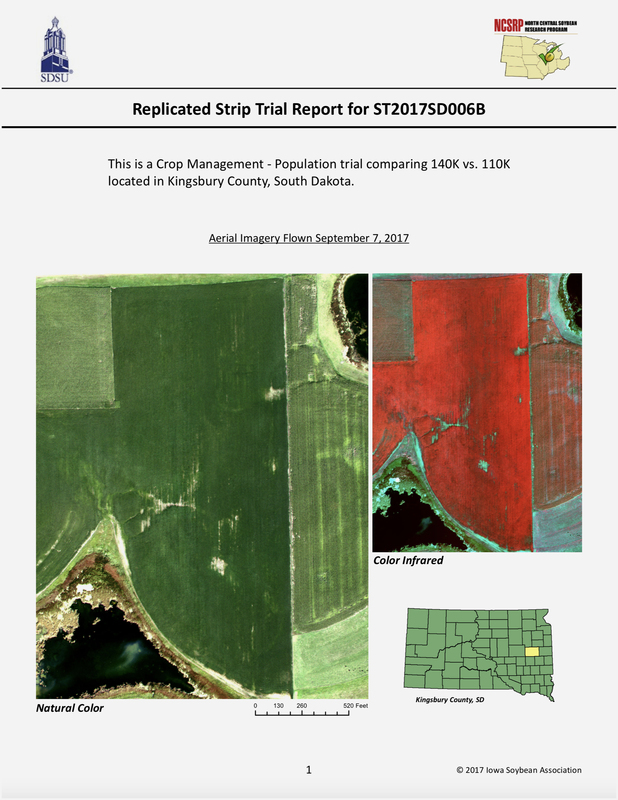 A summary of each individual (anonymous), replicated strip trial is available online for all farmers to use. The summaries include field imagery, yield by treatment, planting date, variety, soil type, and cumulative rainfall.